If I hear one more joke along the lines of “No wonder the weather’s crap, it’s a bank holiday” I may cry. But the rain does provide an opportunity for a brief update on our recent cruising adventures. When we started out from Braunston in January, our only ambition was to get to Hebden Bridge for the Tour de France in July. We did that! 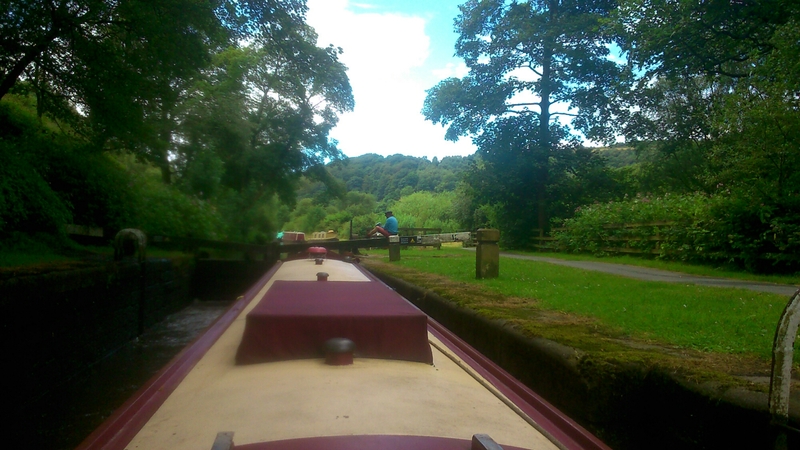 And then we drifted rather aimlessly over the rest of the Rochdale Canal and towards Manchester. 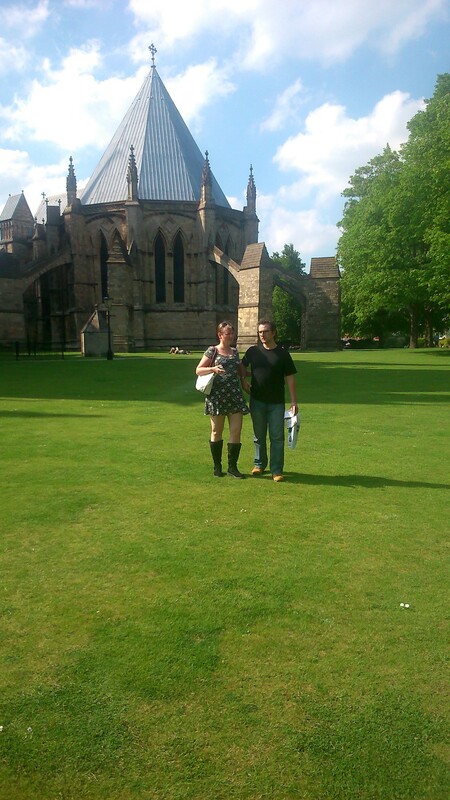 We knew that when we got there we’d have to make a decision about where to go next. But we didn’t want to choose. We could do the short hop to Chester and back, or retrace our steps along the Llangollen Canal, or potter along some other nice canals we’d seen before (eg the Macclesfield and Peak Forest). 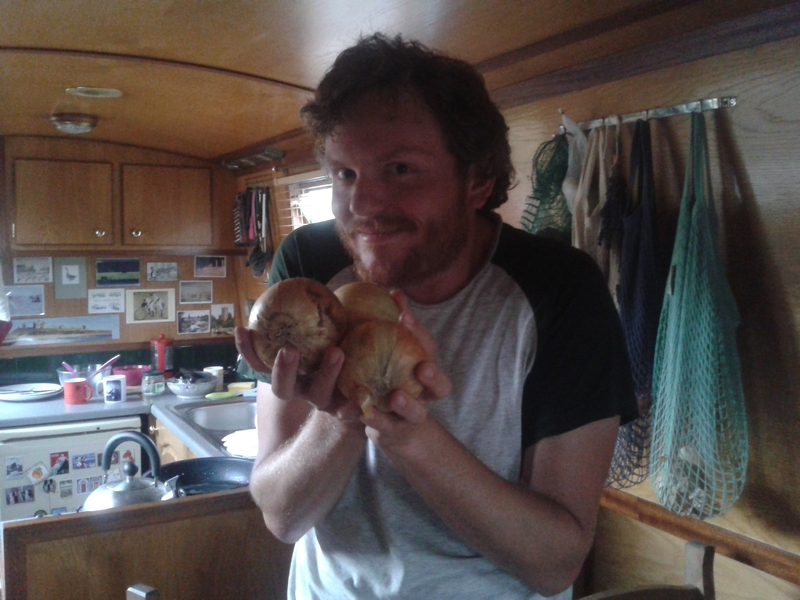 But it would all feel like old ground – just killing time before we pack in this boating lark and go back to the real world of work and living on dry land in the autumn. Boo and bah humbug etc. Then Tom came up with a suggestion. Let’s hot foot it as fast as Felucca can, down the Staffs and Worcester, down the Severn, down the Gloucester and Sharpness Canal and across the Severn Estuary into Bristol! We will be able to see the supposedly very beautiful Kennet and Avon Canal! It will be an epic adventure, a grand hurrah, a marvellous and intrepid finale to our time on Felucca! As many of you I’m sure could have predicted, I panicked. No way. We don’t have time to get there, it will feel really rushed. Not another sea-going tidal adventure. Wasn’t the Wash, and the Trent, and the London Tideway enough dicing with the big seas for one sabbatical? I thought we were leaving the K&A for a leisurely summer holiday in years to come? Then I remembered that the last of Robert Aickman’s seven wonders of the waterways, the great and glorious Caen Hill flight of locks at Devizes, is on the K&A. Hmmm. The completist in me likes the idea of visiting all seven wonders on Felucca. It would be fun to see a new canal. Hmmm… So, one sunny afternoon (remember them?!) I found myself in Nantwich, on the phone to the Gloucester Pilots, booking Felucca in for the passage to Portishead. And now we are minutes away from Sharpness harbour, with fingers crossed for good weather tomorrow, preparing for yet another tidal adventure! Oh my days! Sharpness is at the very end of the Gloucester and Sharpness Ship Canal. From there we put our trust into the hands of the pilot, who will guide us past the turning for Bristol and on to Portishead. There, we sit tight for a while and wait for the tide before turning back and bravely undertaking the last hop to canalised safety on our own. Anyway, more about that when it happens. (If indeed it does happen – weather is an unpredictable beast. And I’m secretly very excited about it all now so don’t want to jinx anything. Don’t tell Tom.) In the meantime, and inbetween offerings to the weather gods for no rain and no wind and a bit of SUMMER WEATHER please, here’s a summary of our August, in which we have travelled from pretty much our furthest point north this year (technically that would be Leeds, but for the purposes of this post I hope you will grant me Hebden Bridge) to our furthest point south (Sharpness going on Bristol). 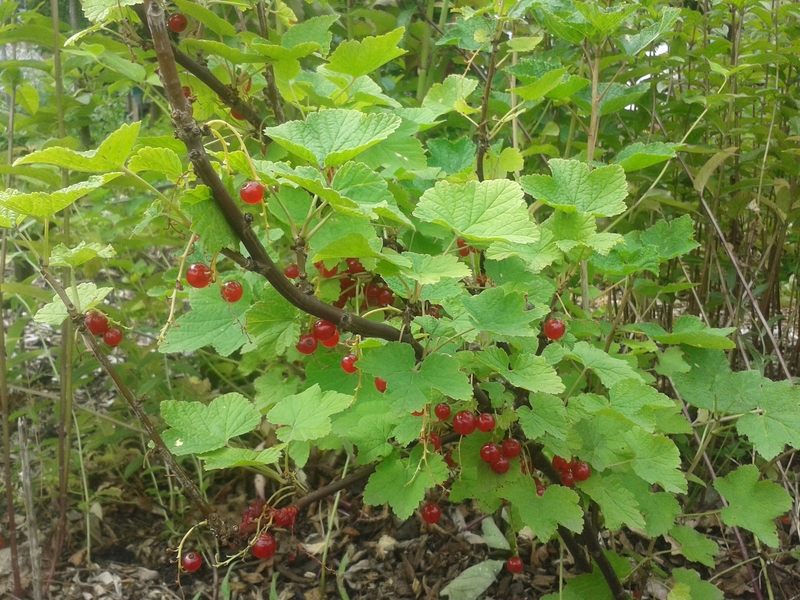 We’ve also had a flurry of visits, from/to – in alphabetical order – Alexa, Ann, Charlie, David, Denis, Graham, John, Kat, Kate, Katy, Luke, Lynne, Maman, Papa, Sue, Suzie. Hotel Felucca will reopen for guests in early September. Some parts of the waterways network have a pretty grotty reputation. The Wigan flight of locks, the run into Leeds from Rodley, Leicester, Leamington Spa, Hackney. We’ve been to all these places and generally found them less bad than their reputation. But Manchester’s ill repute beats all these places. Various people that we met told us that we would encounter: menacing yobbos, tonnes of rubbish in the canal, drunks, public acts of promiscuity, people throwing bricks and very difficult to operate locks. Now, I’m not going to deny that some people seem to have mistaken the Rochdale Canal for a litter bin, but otherwise we had a pretty good time of it. Maybe because it rained, maybe because we got lucky, or maybe – just maybe – because the stories were a tad exaggerated. Who knows? I don’t really care to be honest. I had good fun trundling down the locks into Manchester in the company of NB Bisous and with the help of Charlie and Katy. And Manchester is ace, particularly Castlefield moorings. In fact, the only lewd act I witnessed was Tom waving a windlass around his head provocatively. Tom took my mutterings about “We don’t have time to get to Sharpness” to heart and did his level best to break all known records in getting us from Manchester to just short of the Anderton Boat Lift in one day. 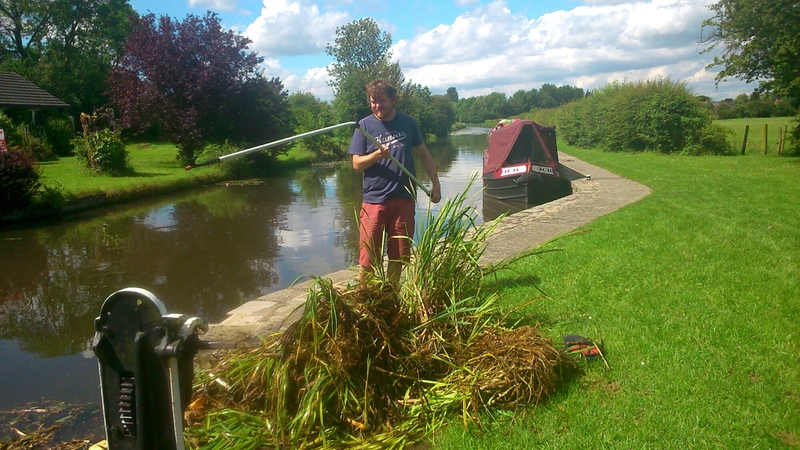 The Bridgewater Canal made this easy going – no locks, big deep and wide water. Easy! After a short hop down the boat lift just because we could, we headed off along the Trent and Mersey and towards the Shroppie. Here’s where the holiday traffic really hit. Last year, we spent the height of summer on the less popular (though incredibly beautiful and well worth a visit) Leeds and Liverpool canal. We saw a few hire boats but no real queues. The Shroppie, however, is an extremely popular stretch. And we nearly witnessed FISTICUFFS over whose turn to go up or down a lock it was. Ye Gods! Mind you, I can understand temperatures running a bit high – we waited at one lock, at the junction from the Trent and Mersey onto the Middlewich Branch of the Shroppie for over an hour. Still, fisticuffs were averted by smooth talking and patient smiles and we moved on to the next lock eventually. Where we had to wait again. Because we were fifth in the queue again. This scene was repeated ad nauseum until we eventually limped into Nantwich at 8pm after 13 hours of cruising only to find there was no room for us to moor up! You will have to imagine the expletives uttered. I couldn’t possibly comment on the veracity of your imagination. We also had Denis, our resident photographer, film-maker, IT trouble-shooter and quadcopter pilot, on board for a stretch along the Shroppie. Here are photos from his trip: http://dezw.eu/gallery/#1 And here is the footage from the quadcopter and video camera: https://www.youtube.com/watch?v=GvL9tMLPTbs&feature=youtu.be&a Enjoy! 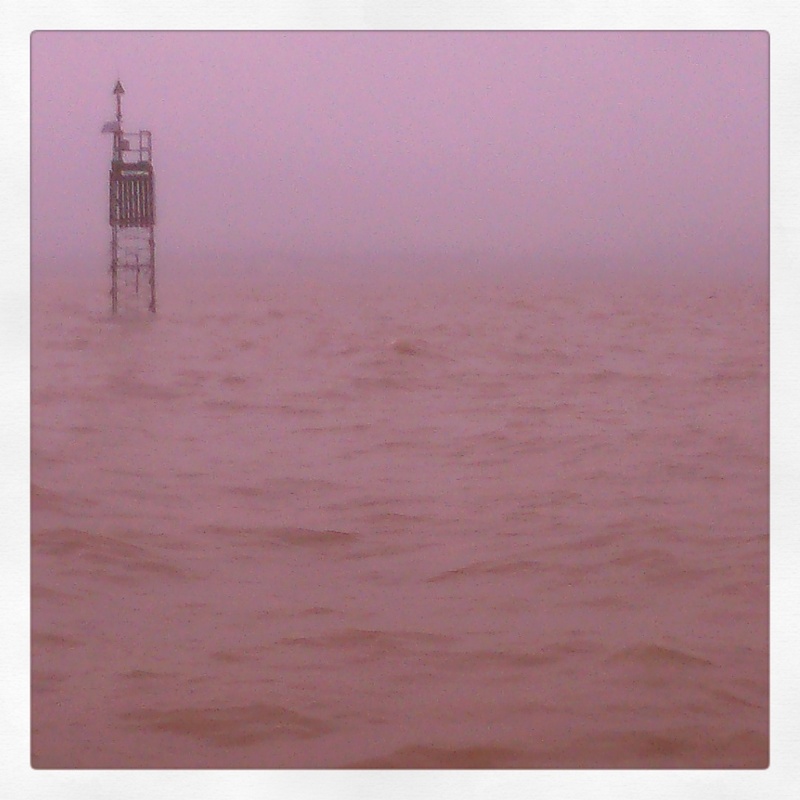 South of Tewkesbury, we finally entered new waters. The Severn was calm and gentle this time – no evidence of the winter’s floods – and we enjoyed a few days of riverside mooring. 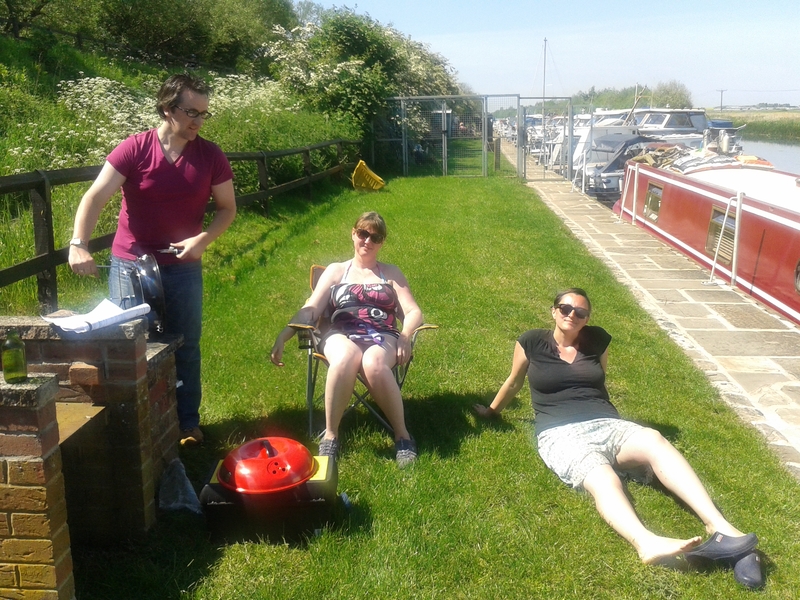 And on Saturday we locked up onto the Gloucester & Sharpness Canal. Gloucester Docks are incredibly impressive and iconic – surrounded by old warehouses and tall ships. 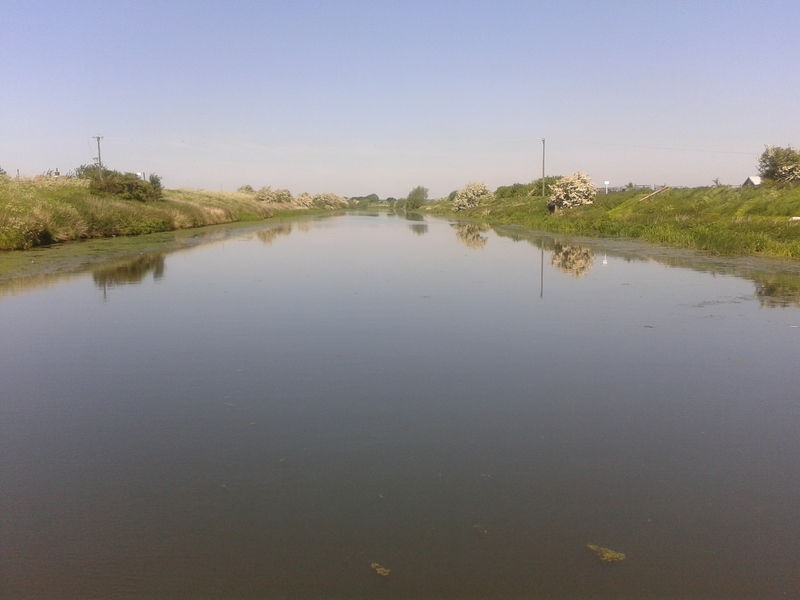 Apparently this was once the broadest and deepest canal in the world! It’s still pretty broad and deep. But I guess others have been built bigger since. Regardless, it’s fun to see narrowboats mixing with big sea-faring cruisers and lifeboats – and fun to put the throttle down and make good progress. We made especially good progress this morning, getting to Slimbridge nice and early to fill up with diesel, only to find out that we had been misinformed and there is no diesel to be had there for love nor money. So we turned round and retraced our steps to Saul, filled up, turned round again and went back past Slimbridge and onto Sharpness. All this in hideous, sopping rain. A journey which should have taken 1.5 hours took 4. We may never get dry again. So I repeat – no more jokes about bad weather on bank holidays. Please! Tara for now and wish us luck and good weather for tomorrow! How delightful to cook in the summer with all those delicious fresh ingredients! A single ripe tomato bursting with Mediterranean flavour, discovered with a fur of mould at the bottom of the fruit bowl … soft fruits off of the vine, bounteous with sunshine and that special Tesco blandness … the barbecue, with its irresistible chargrilled flavour, simmering away disappointingly under an umbrella… It’s an alluring combination that most publishers cooks find hard to resist. 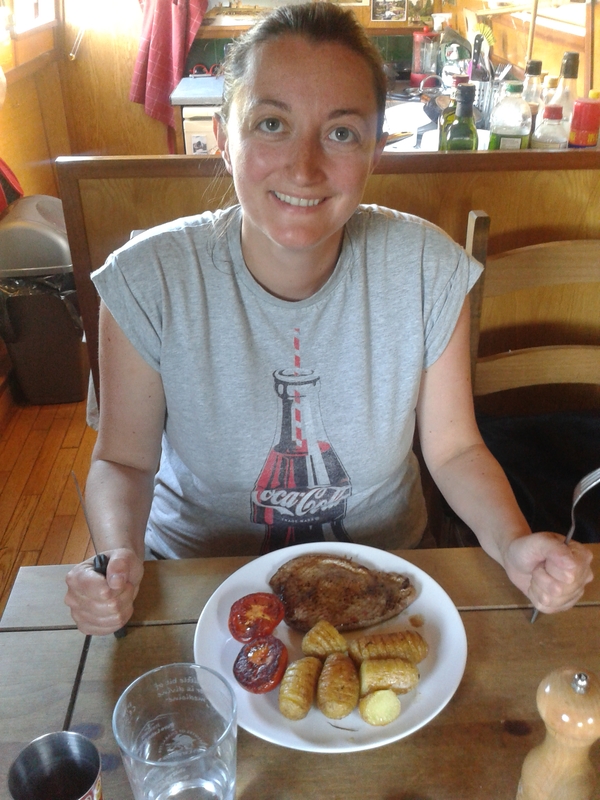 So as the rain pounds down outside, and the lightning dances a jolly jig on the Pennine foothills all around, here are some culinary highlights from Felucca’s pokey galley. 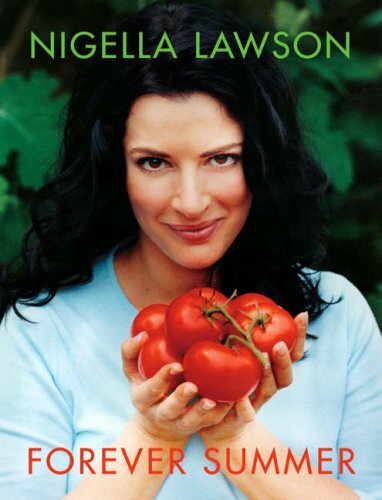 Forever Summer: the “new Nigella” cradles some onions. Seductively. 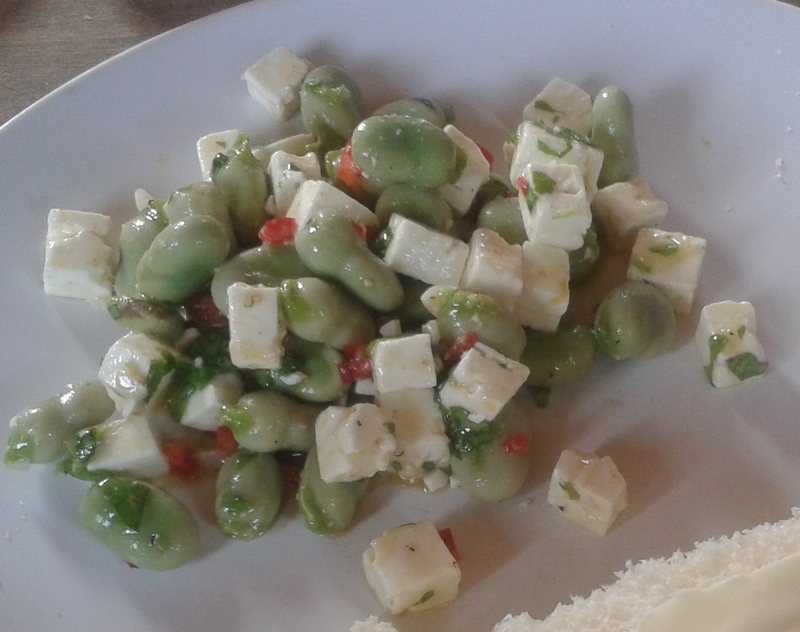 Broad bean and feta salad, with mint, chilli and lemon dressing: Broad beans are an excellent crop. When in glut, one can easily return from the bean patch with several carrier bags full each day. However, regardless of the quantity of pods picked, it is a universal rule that they will nevertheless yield only a piddly little half-bowlful of actual beans. 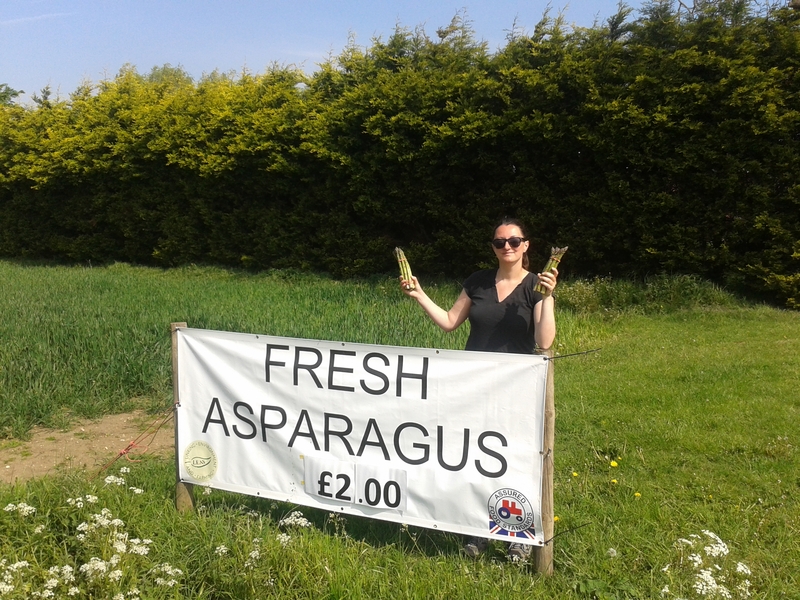 There’s nothing like summer produce from a roadside stall: spanking fresh veg, paid for by a few coins in a tin box. Some enterprising folk have even set up small stalls by locks, to win the trade of passing boaters. We were lucky enough to see one such entrepreneur refreshing his stall very early one morning. He topped up the rustic wicker boxes with eggs and beautiful ripe veg, harvested just moments earlier out of a plastic wrapper from a Tesco bag he carried with him. 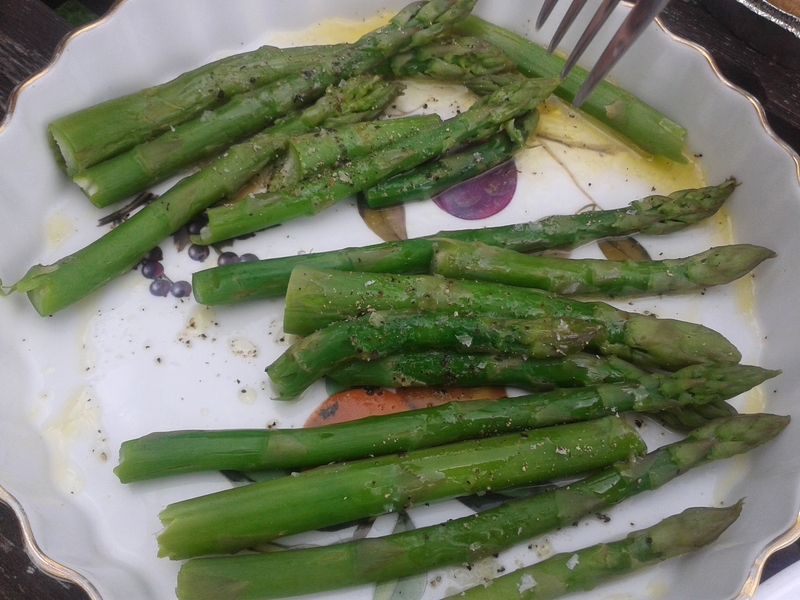 Asparagus spears, with butter, sea salt and black pepper: surely at their best when plucked from the ground at first light, scrubbed briskly of any soil, flown 6,000 miles from Peru in a refrigerated aeroplane, and eaten straightaway. 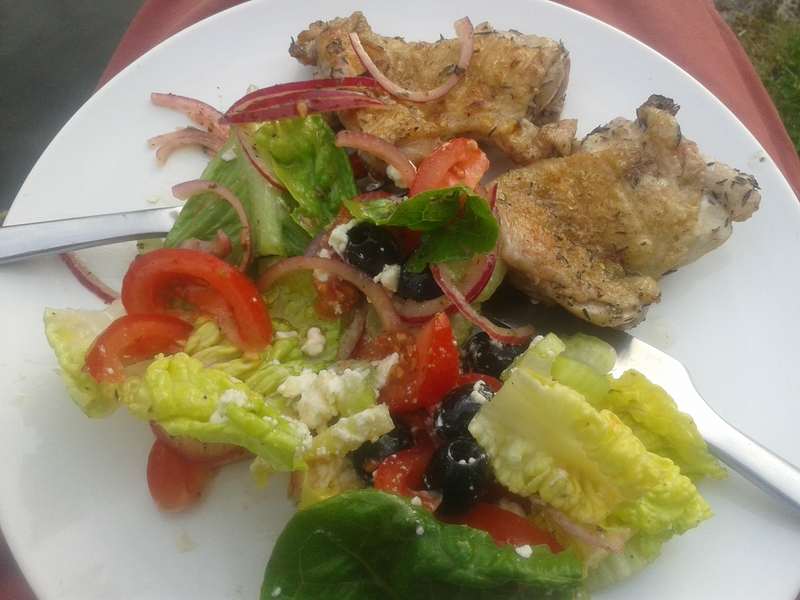 Grilled chicken from the barbecue, with a Greek salad from Nigella’s Forever Summer. This is indeed a delicious meal, and the salad a triumph. An unexpectedly rewarding feature of the recipe was the epic trek round six supermarkets in a gritty South Yorkshire town trying unsuccessfully to find a bulb of fennel. 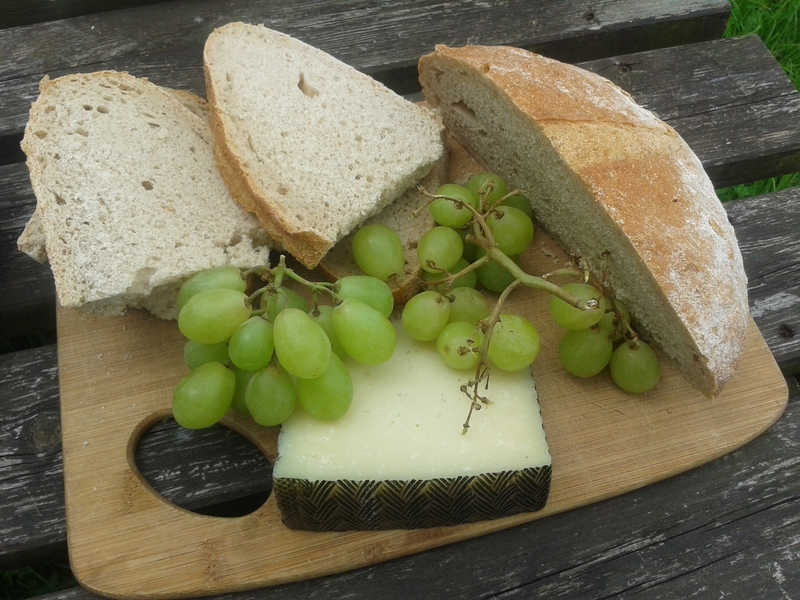 Manchego, grapes, and sourdough bread. Ideal for a pleasing picnic. When planning a picnic, don’t forget to bring some suitable glasswear, ideally something top-heavy that is easily knocked over, dispatching its contents across your shorts. 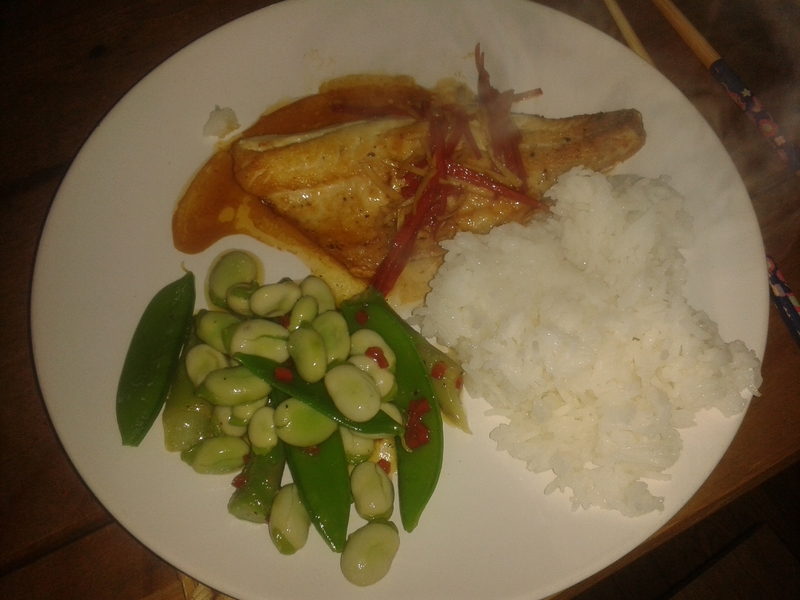 Fillet of sea bass with chilli and ginger; sticky rice; broad bean, chilli and mangetout salad. Sticky rice is a staple of Asian cookery, and brings a lip-smacking new option for those bored with the same old carbs. Just remember to put a tea towel around the smoke alarm for when a moment’s inattention causes the rice to burn into a thick black layer on the bottom of your favourite saucepan. 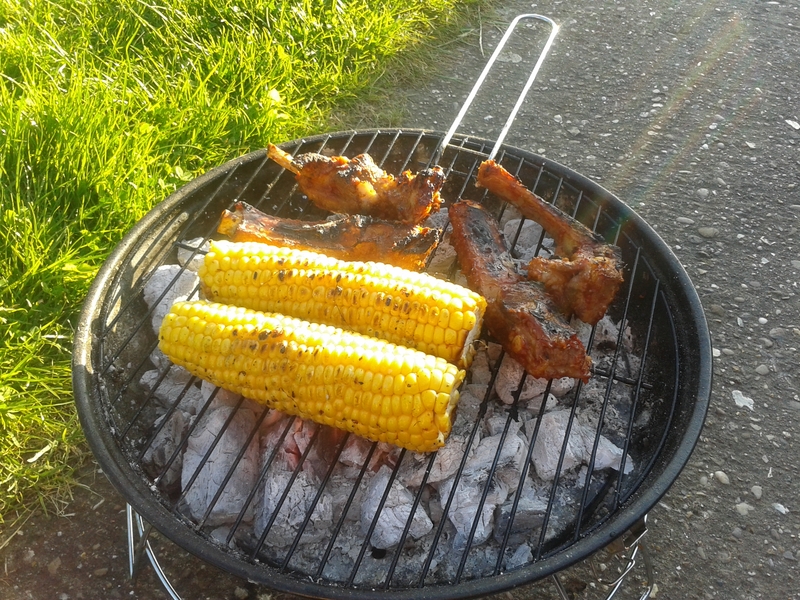 BBQ spare ribs (a la John Torode) and corn on the cob. Bloody lovely. It is important to get the right equipment when barbecuing, and not to skimp on your grill. You wouldn’t want your guests to be disappointed by an uneven flavour or by uncooked food. So we spurned cheap models and in this instance, considered it worth splashing out: investing ten pounds on this sophisticated design from bijou home design boutique Asda. 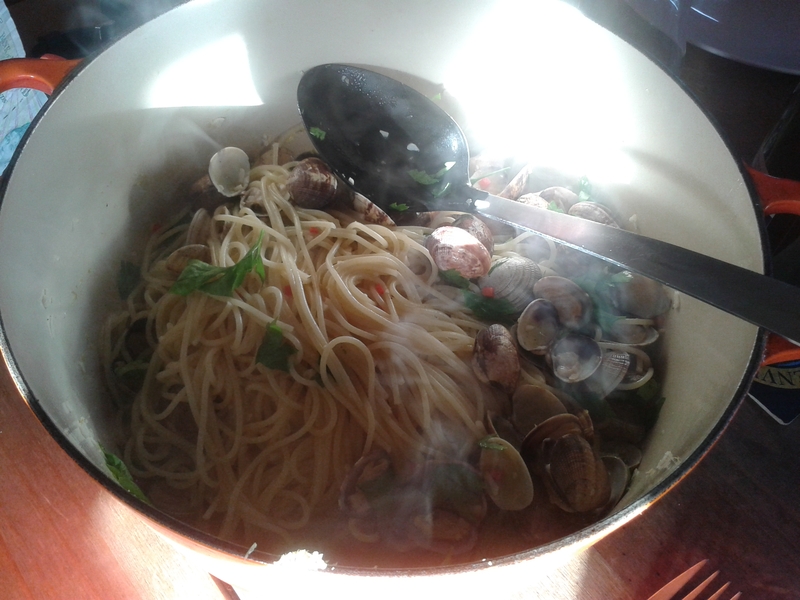 Spaghetti alla vongole: fry a small, finely chopped onion and some chilli, add white wine, steam clams for three mins, add pasta and chopped parsley. An absolute cracker, and superior even to other spaghetti dishes when it comes to getting it down your front. 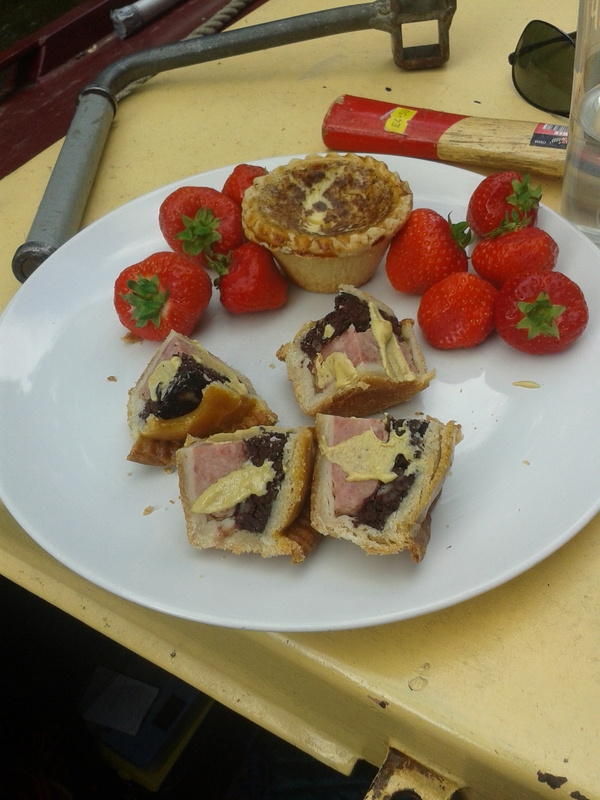 A summery Yorkshire lunch on the hoof: black pudding pork pie (with mustard), custard tart, strawberries. Note the food photography of the highest calibre, both in the arrangement of the fare, and the shooting itself. 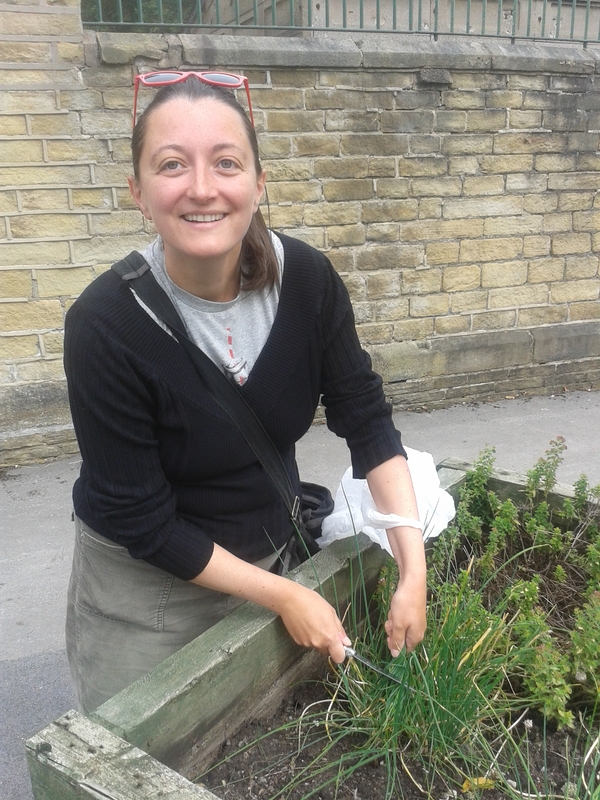 “Incredible, edible Tod.” The small West Yorkshire town of Todmorden prides itself in an innovative scheme whereby communal vegetable patches along the towpath and in the town square provide produce free to both locals and scrounging narrowboaters. Indeed, the mayoress herself knocked on Felucca’s window, and begged us to help eat the glut of free food the town’s exciting experiment is producing. I was therefore surprised to be unceremoniously clobbered to the ground by the butcher, when leaving his shop with six rashers of smoked back and two steaks. 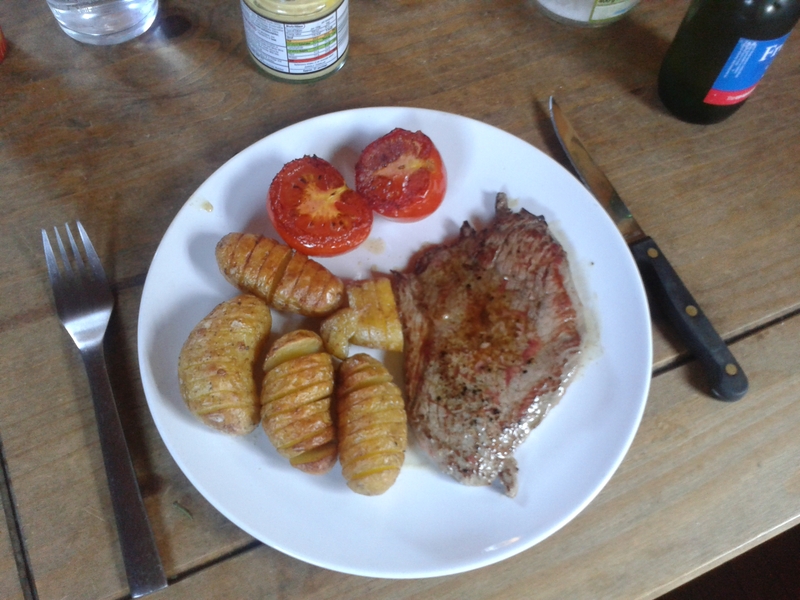 Steaks, baked toms and hasselback spuds. Bon appetit, readers! 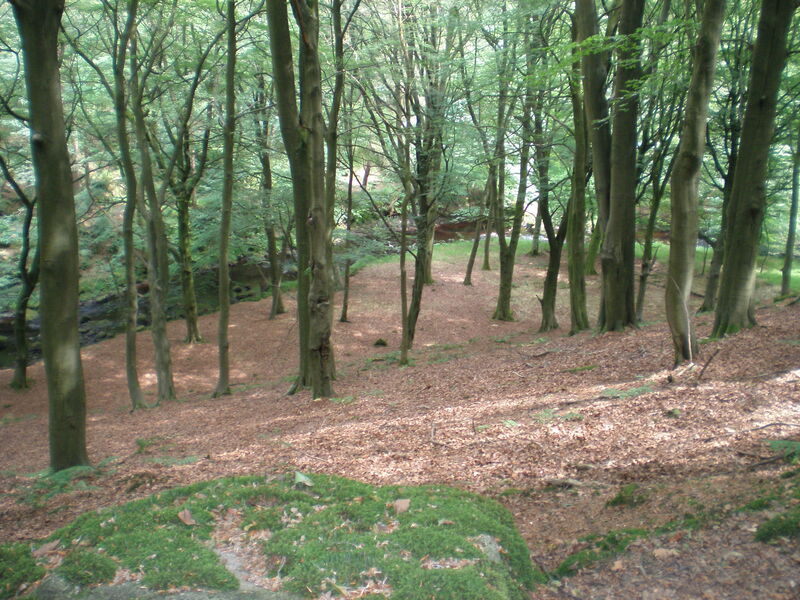 Here we are in Calderdale, West Yorkshire. The River Calder winds its way down excitedly from the Pennine uplands; the rather more stately and sensible Rochdale Canal glides alongside. As lazy Yorkshire stereotype would suggest, there are indeed mills, and some quite majestic ones at that; built to harness the power of the Calder and its tributaries to manufacture cotton products. Gibson Mill. 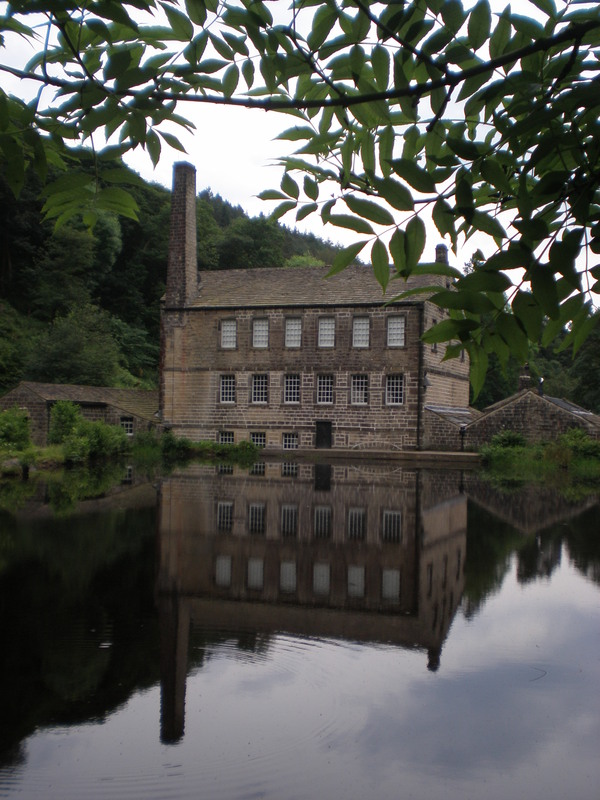 It was a cotton mill until 1890; then an “entertainment emporium” including an early 1900s roller disco; and nowadays National Trust museum and tea rooms, with the electric coming from a hydroelectric turbine still powered by the river. 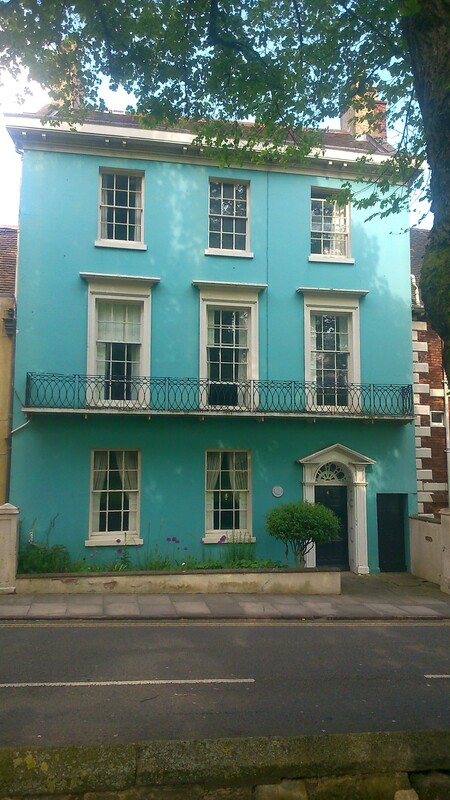 These parts have plenty to offer the wandering canal boat captain. 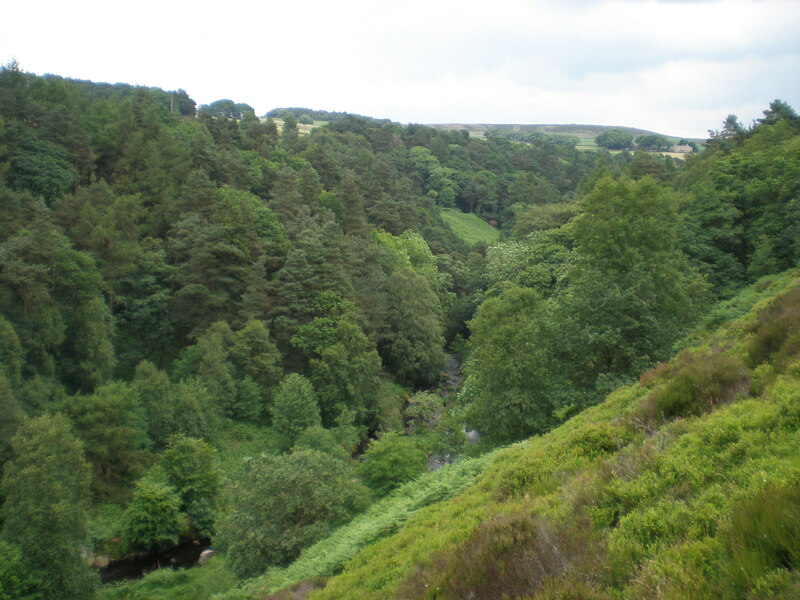 Hebden Water, an excited tributary of the Calder, runs south from the tops, i.e. the Pennine uplands, with great energy and many a whirlpool, waterfall, weir and cataract; carving out a majestic V-shaped valley straight from a 3rd year Mr. Smith geography lesson. This rather splendid landscape is Hardcastle Crags, where I went a-wandering this morning. It’s just beautiful. Stately woodland, plunging down into the river valley. Lots of tree creepers (I think) tweeting and being busy in the trees. Hebden Water flows down from the tops, brown with peat. 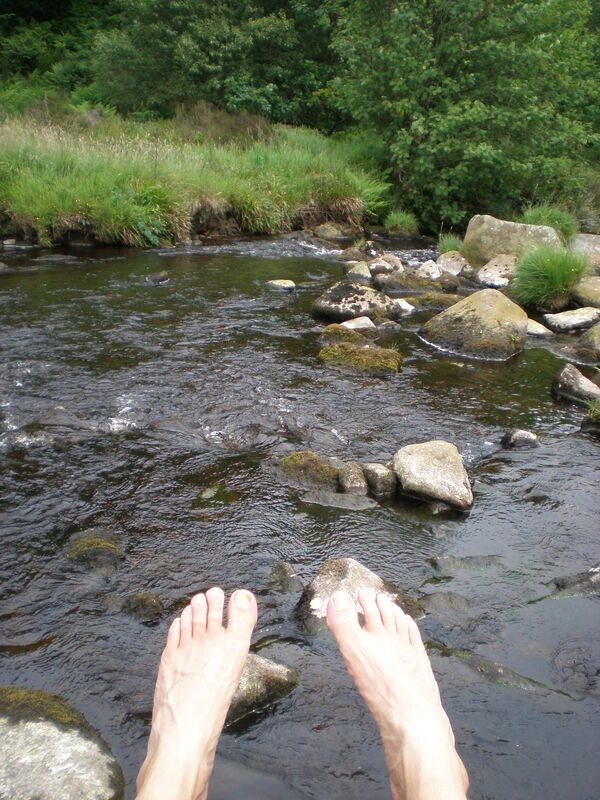 It flows under my feet, down past that mill you saw earlier, to Hebden Bridge to join the Calder. Then east to Sowerby Bridge where it becomes navigable as the Calder & Hebble, recently infamous as having tested Emily to the limit. After that it’s down to Wakefield, confluences with the Aire and then the Yorkshire Ouse, and down to the Humber Estuary, under the Humber Bridge, and into the North Sea. But that’s not the main reason we are here. 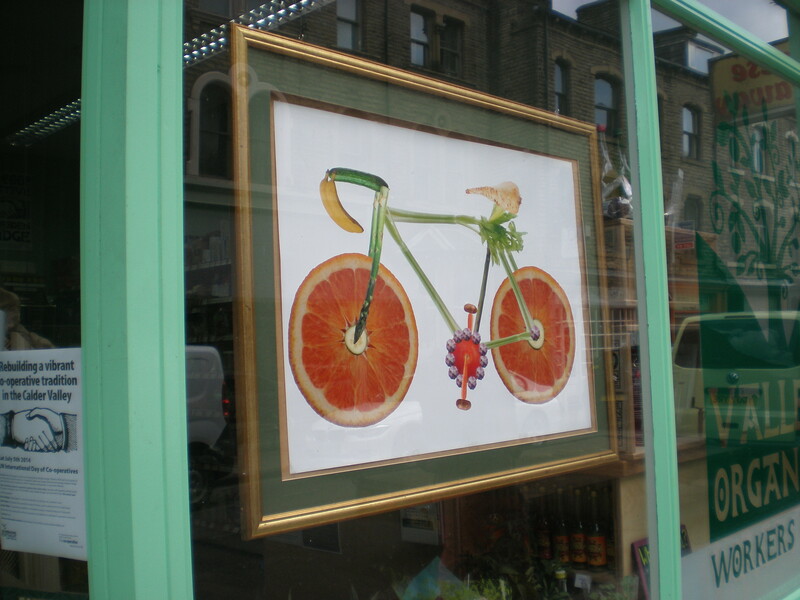 On Saturday, the world’s greatest bike race starts in Yorkshire: the “Grand Depart” of Le Tour de France. 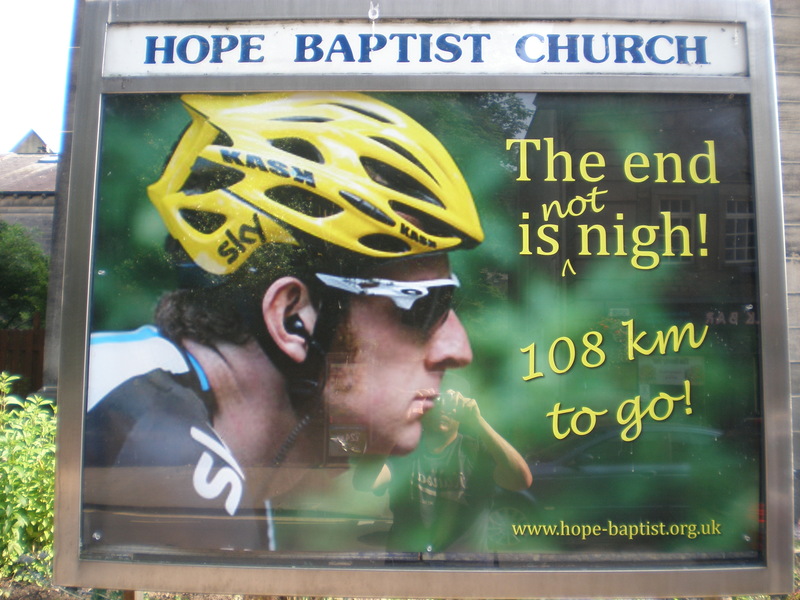 The Tour likes to start in foreign climes, and does every other year or so; last visiting Britain in 2007, where a short first day “prologue” was in Hyde Park, followed by an official first stage – London to Canterbury. I can myself confirm this, having witnessed mayor Ken Livingstone waving the start flag on Tower Bridge. And jolly good it was too, I got about a hundred colourful hats from the publicity caravan, all of which disintegrated within a week. 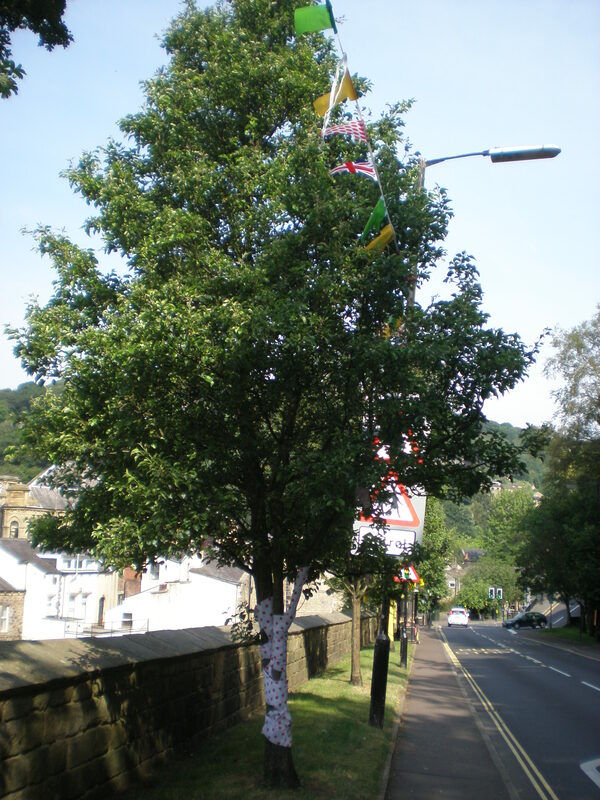 However, no wussy prologue for Yorkshire of course – none of these fairy southern habits for God’s Own County. Instead, things kick off with a proper 190km stage from Leeds to Harrogate on Saturday, and a 200km stage on Sunday from York to Sheffield. 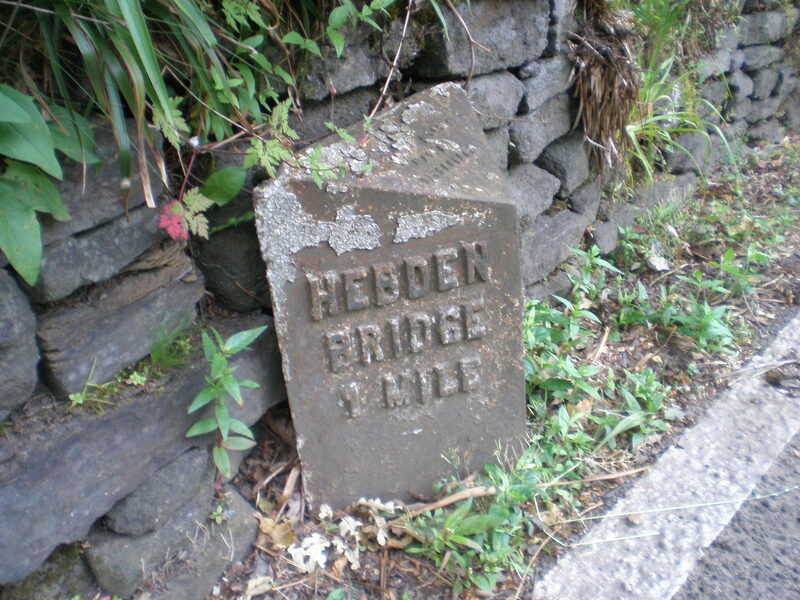 Hebden Bridge is halfway through the second stage, and is also on the Rochdale Canal… So here we are! The riders will sweep into Hebden Bridge 7km after cresting the, er, “Cote d’Oxenhope Moor”, a category 3 hill with a pretty juicy descent leading down into the valley. 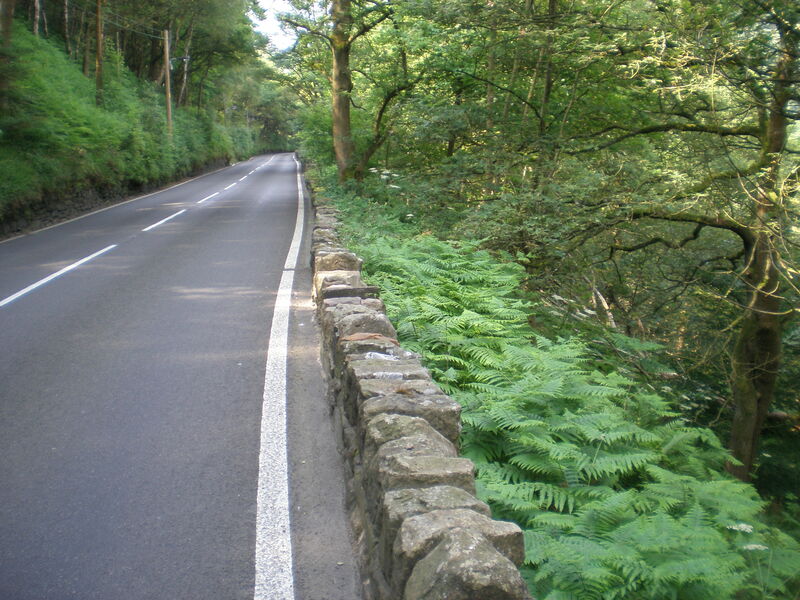 Here’s the road they’ll come down: not very wide, no pavements, a stone wall on one side, and a stone wall and/or wooded precipice on the other. Scary hill. Even mountain bikers were tearing down here at 40mph earlier. Then they’ll ride down into the town. 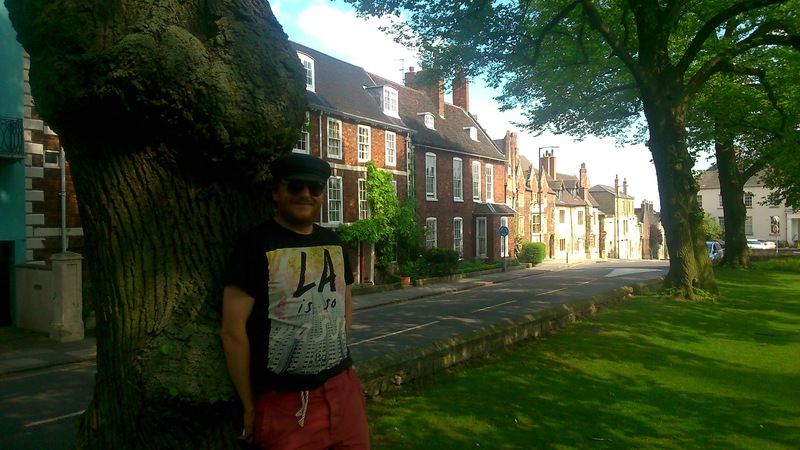 It’s a beautiful and charming place anyway, filled with great cafes, pubs, shops, street musicians, poets and general hippy bonhomie a la Brighton or similar. Now Le Tour’s in town, albeit for perhaps 2 minutes, they’ve gone completely crazy. Tree getting into the spirit of things. Note also green, polka dot and yellow jersey bunting. Le Maillot Jaune makes a feed station stop in the square. 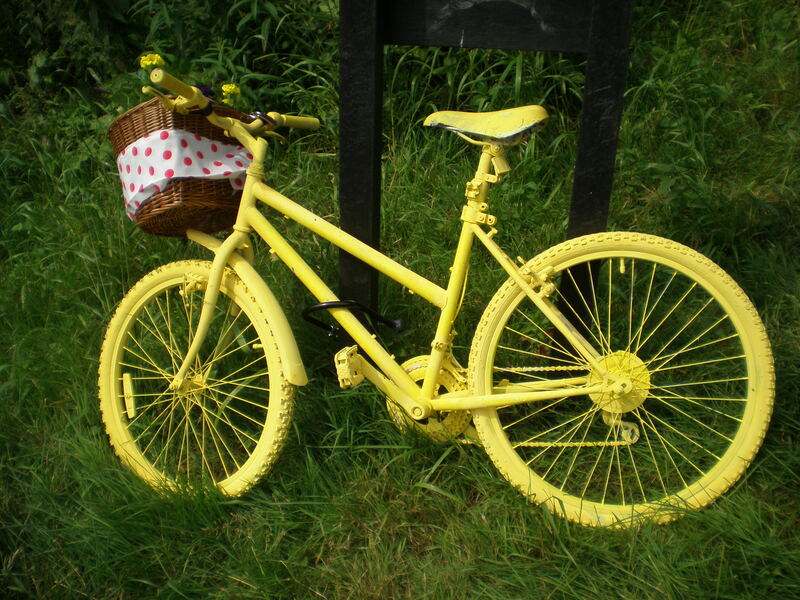 Yellow bikes, yellow teddy bears, yellow bunting, yellow wheelbarrows. 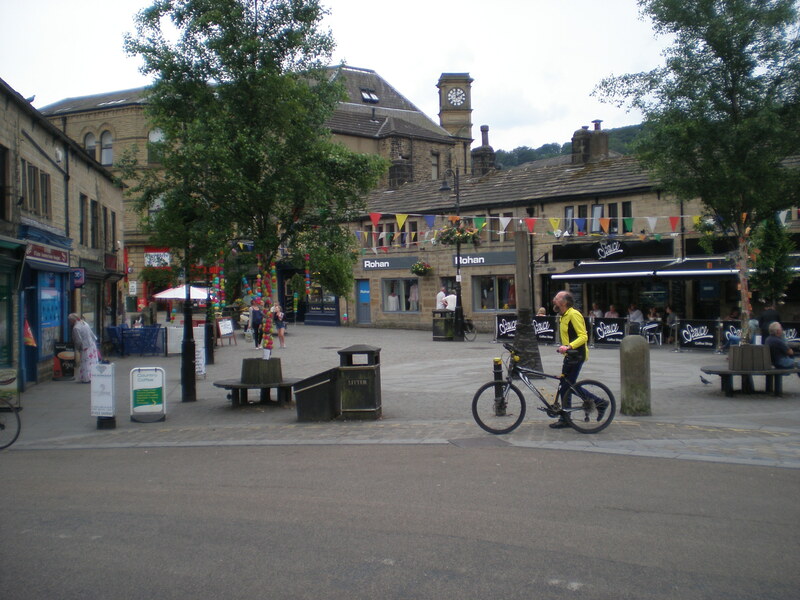 The lock keeper at Sowerby Bridge had painted his windlass yellow. This is my favourite one. Funny, irreverent, etc. But: spot the deliberate mistake! Then there is an art festival, a big screen in the park, and lots of tours, events, and food stalls to keep the punters happy for the other 47 hours and 58 minutes of the weekend when the tour isn’t racing down the high street. And last but not least there is a jolly boat festival, with umpteen pretty craft lined up through Hebden Bridge; and Felucca has joined the throng. 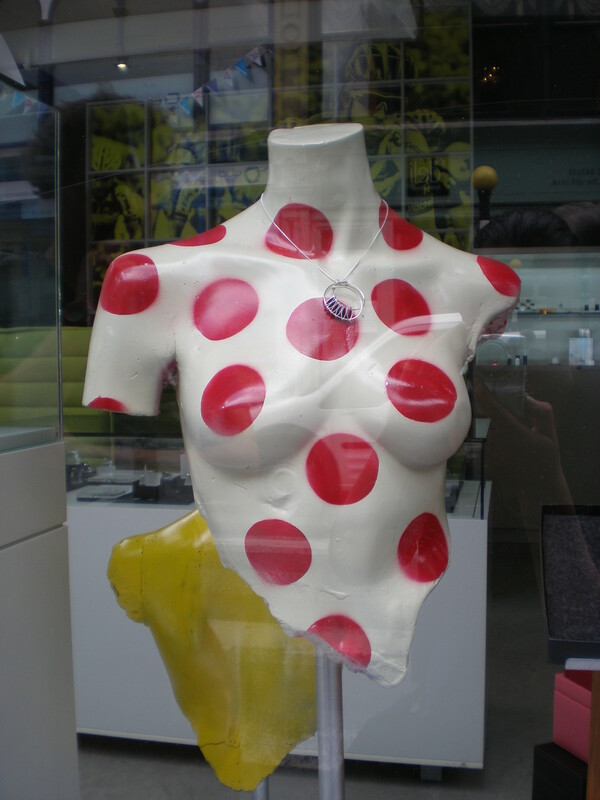 Vive le Tour; and va va Froome! Brewing boat. There is also a fudge boat, an antiques boat, and a horsedrawn boat, as well as hangers-on like us! Ridiculous canal. Should be banned. 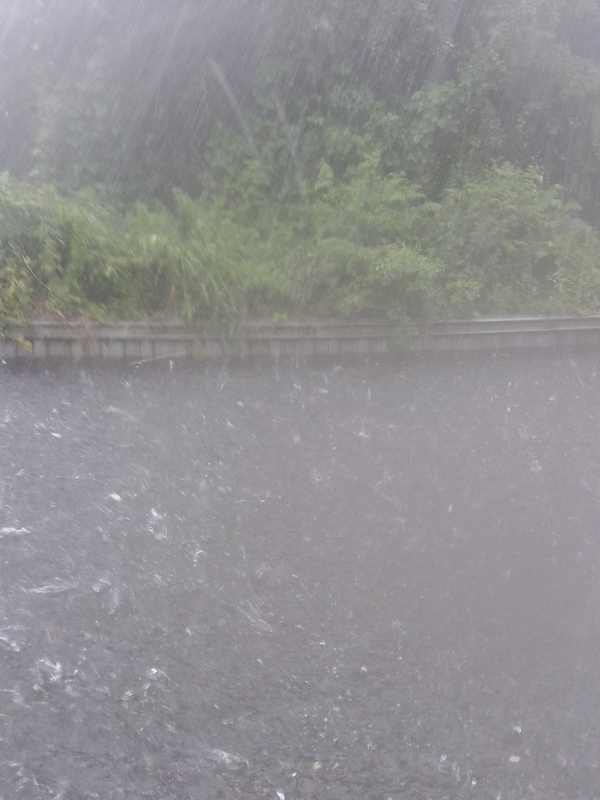 That’s hail, that is. It made a friendly visit to Felucca along with its buddies thunder, lighting, and torrential rain. Imagine the dulcet tones of marbles fired by a thousand paintball guns onto a large kettle drum, and you’ve got a pretty good idea what this was all about. Lincolnshire is mind-bogglingly large and flat and rural. 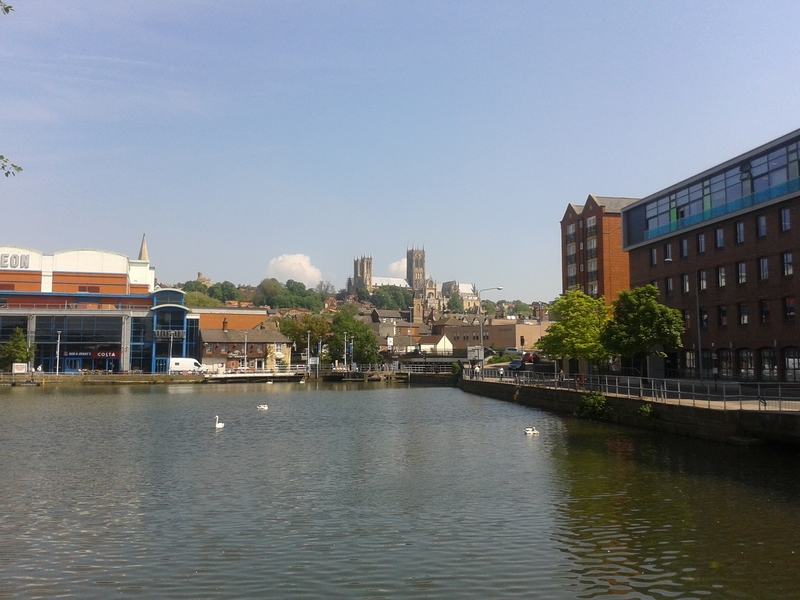 We don’t see much of it as the river Witham is flanked on both sides by enthusiastic embankments. The occasional lorry, a pylon, the roof of a house, a plane looping overhead. This makes journeying the length of the river an oddly isolated experience. We leave Boston on Wednesday, hurtling our way along the straight, flat river towards Lincoln and the Roman-built Fossdyke canal. On Friday night we are joined for the weekend by Nick and Elizabeth, just in time for what will hopefully prove to be the first of many heatwaves this summer. In honour of the sun, I purchase a new pair of sandals. 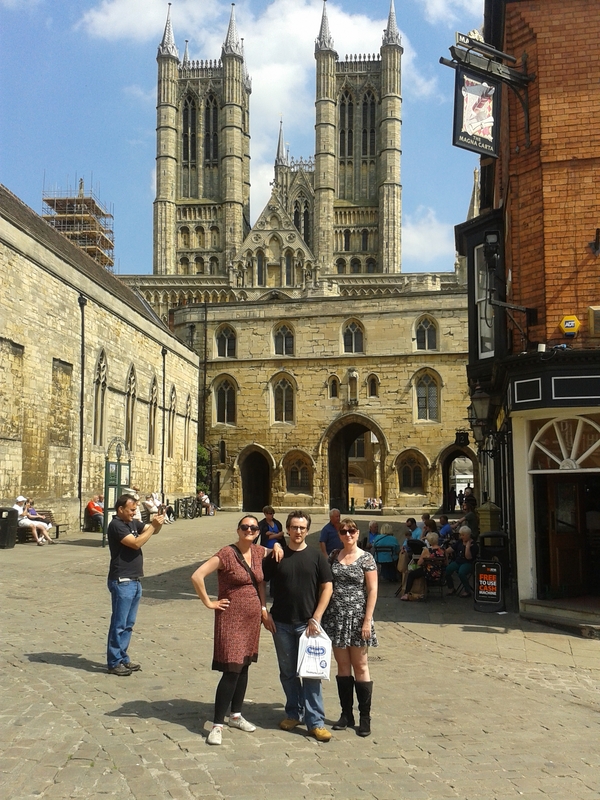 Arriving in Lincoln we discover that all the contours of the county have been compressed into a single breath-taking gradient, an ascent so dizzying that metaphor and allusion were beyond those who first climbed and conquered and named it. Steep Hill transforms the citizens of the city into zombies, shuffling slowly up the slope, arms stretched out ahead in search of – railings? fresh meat? Lincolnshire sausage? – muttering portentously under their breath. 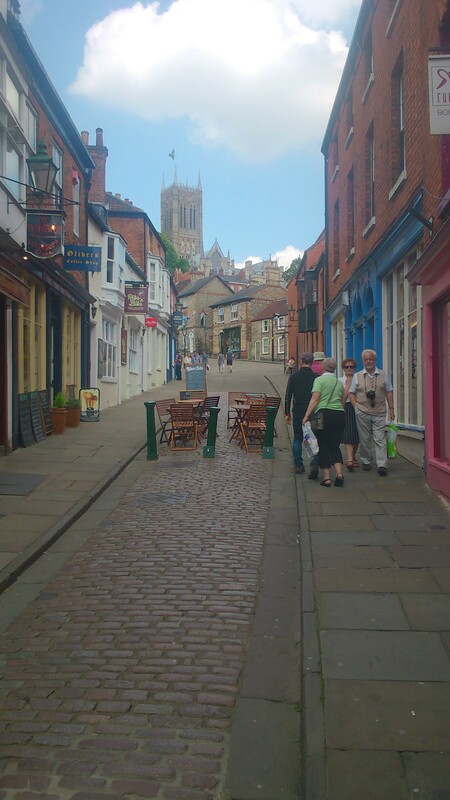 Bottom of Steep Hill. Picture does not do justice to gradient. 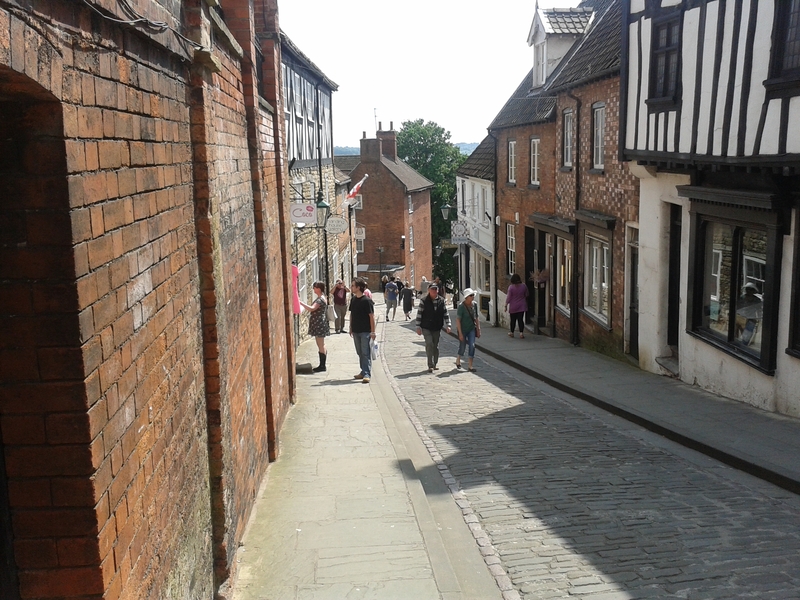 Top of Steep Hill. Picture still does not do justice to gradient. 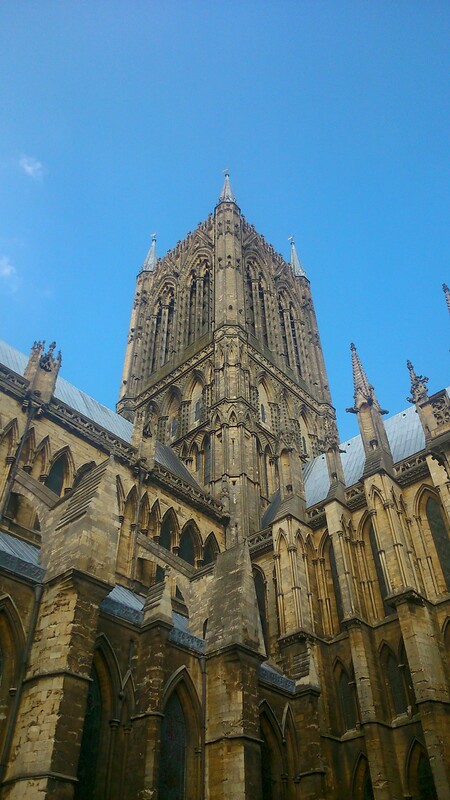 Tis indeed a fine city, complete with castle, cathedral and copy of the Magna Carta. Swans nest outside the university buildings, oblivious to the oohs and aahs of passing students, presumably not zoologists as they seem amazed by the reproductive process. I am more amazed that the swans don’t attack anyone. 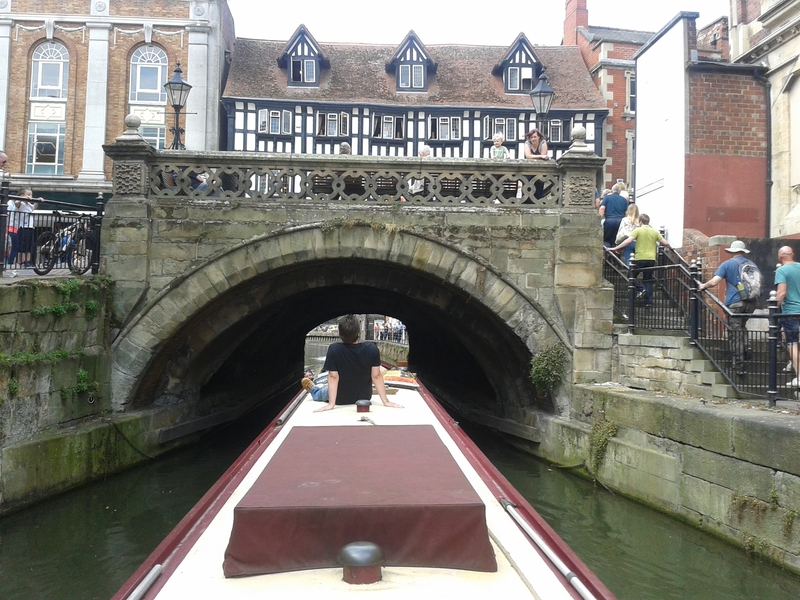 Glory Hole – bridge in Lincoln. 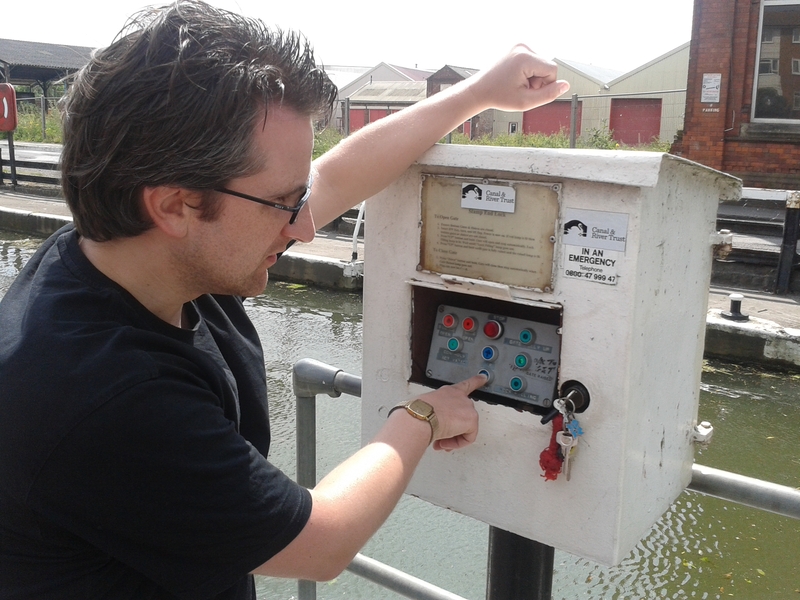 Nick operates the lock at Lincoln, one of only two on this whole stretch. Told you Lincolnshire was flat. In honour of the heatwave we have invested in a fine new BBQ and are subsisting on a diet of grilled everything, fresh Lincolnshire asparagus and ice cream. Assembling the new BBQ. Thank God Nick was here.